A traditional roast with a contemporary flavor twist. If desired, stir in another 1 Tbsp. of sugar for added sweetness. In a large saucepan or Dutch oven sprayed with nonstick cooking spray over medium high heat, brown beef roast on all sides for 5 minutes. Add Worcestershire Sauce and bring to a boil. Cover, reduce heat to medium low and simmer for 20 minutes. Stir in Pasta Sauce and sugar, and continue to simmer for additional 1-1/2 to 2 hours, or until beef is tender, turning occasionally. Remove beef from saucepan and allow to rest for 5 minutes before slicing. 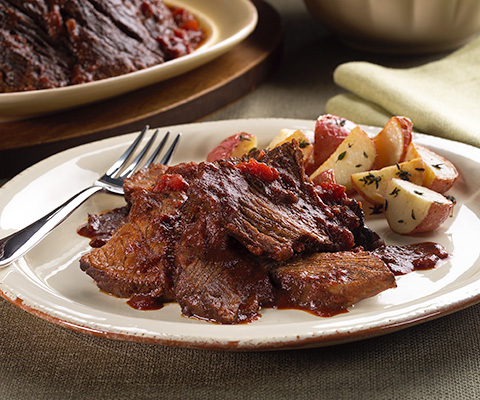 For slow cooker method, combine beef and Worcestershire Sauce in a 5 qt. slow cooker. Cook on high heat setting for 1 hour, turning occasionally. Stir in Pasta Sauce and sugar, and continue to cook on high heat setting for additional 2-1/2 to 3 hours, or until beef is tender, turning occasionally. I love this recipe. It's soo easy to do. I did the slow cooker method. I used the Classico Italian Sausage instead (I think it's ten times better).